HONOLULU—To cope with a noisy problem, Hawaii calls on Keevin Minami, a specialist with an unusual talent: He speaks coqui. Mr. Minami is a Hawaii Department of Agriculture land vertebrates expert. One of his tasks is to ferret out tiny coqui frogs. “Ko Keee…Ko KEEE” he chirps to demonstrate the male coqui’s mating call he learned by standing under trees and mimicking them. Mr. Minami’s coqui locution is so precise he draws the females out. Property owners at their wits’ end call him in to help them get rid of the frogs. 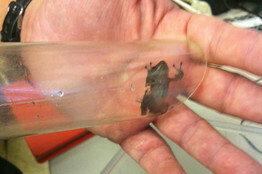 Armed with a head lamp, he chirps under trees until the frogs jump into what he calls his “coqui wand,” a tube with a plastic bottle at the end that passes as a trap. “If you go into the forest at night, they’re so loud, your ears start to ring,” says Mr. Minami, whom colleagues have nicknamed the Frog Whisperer. He is part of the frog-busting team the state has dispatched to nab the tiny amphibians. He tries not to kill them, preferring to bring them back to the terrarium in his office near Honolulu’s port, to live out their natural lives. The frog has brought noisy trouble to paradise, and Hawaii is officially at war with it. Coqui frogs chirp at night at up to 90 decibels, roughly the noise level of some lawn mowers from about a foot and a half away. Locals and tourists complain they can’t sleep for the racket. “It’s horrible,” says Robin Midkiff, whose Oahu home is near a lush area that has been occasionally pierced by coqui chirps and who has heard them on trips elsewhere in the islands. Moreover, the frogs are illicit interlopers. Originally from Puerto Rico, the coqui have been arriving in Hawaii as cargo-ship stowaways since the late 1980s. They are multiplying rapidly on the islands, with no natural predators. So the state has declared the coqui amphibian non grata, and multiple agencies have plotted how to capture or exterminate them. Coqui advocates accuse the state of launching cruel “frog wars,” but the state counters that the frogs threaten the ecosystem by eating too many bugs that are rightly the prey of native species. They are elusive: About the size of a quarter, they camouflage themselves with a brown or yellow coloring that blends into Hawaiian vegetation. 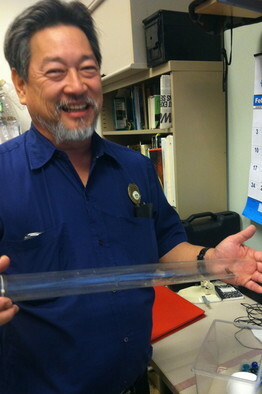 Keevin K. Minami from the State of Hawaii Department of Agriculture, with a ‘coqui wand’ and the coqui frog in it. The frog folderol began in 2004, when officials declared a state of emergency on Hawaii’s Big Island because of the invaders. County, state and private groups came up with plans to get rid of the frogs, including tracking populations through GPS devices. They lost the battle on the Big Island, according to a 2010 island-wide coqui task force report. “There’s nothing we can do about it,” says George Applegate, executive director of the Big Island Visitors Bureau. But state officials hope they can stop the frogs from taking over Oahu, the most populated island. One recent weapon is what frog-busters are calling a “hot shower chamber,” a modified freight container used by nurseries to ship plants, with multiple heads that spray heated water onto the plants and kill any coquis that might be lurking there. He became an activist on the issue a dozen years ago when state officials discussed an effort to combat the frogs on the Big Island by bombing them with a diluted caffeine spray in an effort to give them heart attacks. Officials abandoned that method of frogicide amid complaints of animal cruelty and because of environmental-regulation hurdles, according to frog experts and official reports. Many methods of ridding them aren’t pleasant, says University of Hawaii entomologist Arnold H. Hara, who has helped in the frog hunt. “It’s all cruel,” he says. Mr. Singer advocates, instead, for frog sanctuaries and deportation. He and his wife have set up a nature preserve for coqui on Hawaii’s Big Island and have posted a YouTube video as part of his campaign to sway Hawaiian hearts and minds toward coqui compassion. “If frogs ever do get here, they’re going to be safe and we’re going to protect them,” he says in the video. Mr. Singer says he and a small group of volunteers have tried to negotiate with the Hawaii Department of Agriculture to deport the frogs back to Puerto Rico under a program they have named Frog Repatriation and Overseas Gifting program, or FROG, but to no avail. “I see this as an anti-immigration effort against frogs,” Mr. Singer says. Mr. Minami says he recalls discussions of trying to deport the coqui but says the idea didn’t go anywhere. In Puerto Rico, where the frogs are native, the coqui is the official mascot of the island, says tourism representative Reuben Castro. He likes the frogs and describes their sound like a whistle. The chirps of the coqui are so popular some recording artists have incorporated them into their pop songs. A saying there is “Soy de aquí como el coquí” (I’m from here like the coquí), according to a private Puerto Rico tourism website. The frog’s foes in Hawaii do have one new hope: the brown anole lizard. That reptile, says University of Hawaii’s Mr. Hara, may eat the coqui. It, too, is an interloper to the islands. But it goes about its business quietly. A version of this article appeared April 4, 2013, on page A1 in the U.S. edition of The Wall Street Journal, with the headline: When It Gets Too Noisy in Paradise, They Call the Frog Whisperer.